Go Forward Bravely is one nightmare of a game for anyone who doesn’t know how to multitask. 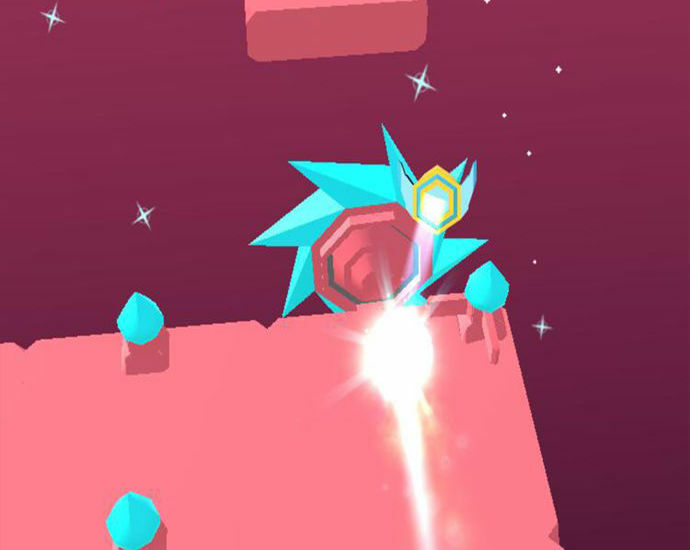 Played on a floating 3D stage – not unlike the majority of avoider games we reviewed in 2018, 2017, 2016, you get the idea… – your mission in this game is to avoid obstacles while creating the stage ahead of you for your ball to roll on. Obviously, this isn’t easy, so to make up for your lack of mental computational power, you will most likely end up focusing on one aspect of the stage and ignoring pretty much everything else in order to survive. This is where the missiles come into play. In order to prevent our glowing ball from falling off the edge of the stage, we focused our attention on jumping and rotating the stage, ignoring pretty much everything else. Obviously ignoring any aspect of a game has its downfalls and in our case, it was the missiles. Other than the fact that it is incredibly difficult, there actually isn’t all that much to complain about in Go Forward Bravely. The graphics are nice, (except for the point we mentioned above), the controls are simple enough once you get used to them, and frankly, the levels are far too hard to become repetitive. If you possess the skill required to play this game, Go Forward Bravely is a game you will likely really enjoy.